Former Denver Bronco KaRon Coleman, now a Send North America: Denver church planter, continues to use football as a way to connect with men and their sons through coaching and mentoring. Coleman’s Northeast Fellowship is re-launching this year in a new location. Coleman coaches for the Far Northeast Jets in a community junior football league. NAMB photo by Erik Stenbakken. DENVER—Any athlete who has been sidelined wants to get back into the game as soon as possible. KaRon Coleman lived that truth when he played for the National Football League’s Denver Broncos and now he’s doing the same as a church planter. Coleman, who is starting a church in Denver’s Aurora community, experienced his first major sideline incident in the Mile High City in 2002. After three seasons as a running back for the Broncos, an injury ended his football career. But it only accelerated the vocation he knew he would pursue when his playing days ended – church planter. 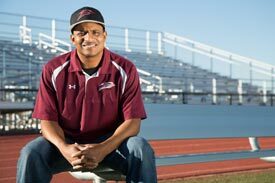 While playing football at Stephen F. Austin State University, Coleman said he felt a strong call to ministry. “I went to Bible college to complete my degree and later went to Southwestern Baptist Theological Seminary,” said Coleman, who continued his education following his NFL career. Along the way Coleman married, had five children and planted a church in his native Houston. Coleman says his experience in Houston planting Fort Bend Community Fellowship was great, but he and wife, Jasmine, sensed a call to serve in a place with greater need. They thought Denver might be that place. Coleman experienced his share of diversity, from overcoming the absence of a father in his home growing up, to graduating college undrafted by any NFL team. Coleman used the latter experience to make himself a free agent the Denver Broncos could not pass up. Coleman enjoyed his years with Denver and was a solid offensive contributor. The former experience, life with a single mother raising children alone, gave Coleman the added determination to do something to help change that circumstance for other children. Beyond mentoring and coaching, Coleman has released his first book, Don't Count Me Out, his story of overcoming diversity through faith in Christ and perseverance. He hopes the book will help convince men to live up to their obligations and help children find real hope through the gospel. The Colemans moved back to Denver in 2010 and launched Northeast Fellowship in January 2011. Just like an athlete sometimes has to mount a comeback after being sidelined, Northeast Fellowship is re-launching this year after coming through some challenging days. The re-launch includes a move to Saturday night worship in a new location. Both changes are aimed at better connecting with people’s lives. “We are attempting to build the church organically,” said Coleman. “We are multi-cultural, multi-generational and more suburban than urban. Almost all of our members are from Denver. We’ve seen about 75 people come to faith in Christ and have baptized 25. Learn more about Coleman and Northeast Fellowship at northeastfellowship.org. Discover how you can connect with Send North America: Denver at http://namb.net/Denver. Joe Conway writes for the North American Mission Board.